It has come to our attention that there is extensive harm and death caused to ducks and ducklings that reside in the Mt Eliza area. As well as other animals and especially birds. 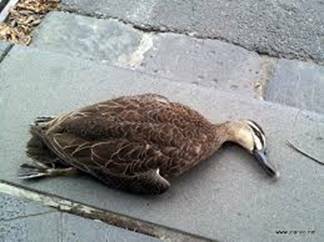 Yet again few days ago, we laid to rest a father duck who was either hit by a car/cyclist/ and left to die on my footpath. His body was still warm as his feathers gently peeled off his body as I held him safe in my arms. We have given him a respectful burial as he deserves. The father duck was not dissimilar to this duck pictured. We need Ducks Crossing signs erected in a number of locations. On my road, and property for example, we have at least 4 families of ducks and 8 ducklings each, roaming, that are constantly crossing the road, resting on the footpaths etc. The cars are known to ‘fly’ around the bend on the highest point of Fulton road, yet the council km signage has not deterred motorists and cyclists from slowing down. As a result of the lack of animal crossing signs, there are constant deceased animals/ducks/birds eg magpies. Lorikeets that are being killed and left on the roads, only to be run over and over and over by the rushing motorists. On a daily basis in Mt Eliza I pull over and pick up the dead animals/birds and give them a humane burial. It is horrible that many drivers and local residents are blinded by the vision of dead animals being driven over. And especially as these animals and birds are otherwise often kept as pets, or promoted as Australia’s special wildlife. They are not treated as special when they are killed on the roads and left to die. I request that signage be erected on known areas where ducks/animals/birds congregate asap to stop this unnecessary act of cruelty and neglect.